As the winter season begins to wind down, many Virginia residents are eagerly looking forward to completing home improvement projects that will help increase the value and enjoyability of their abodes. 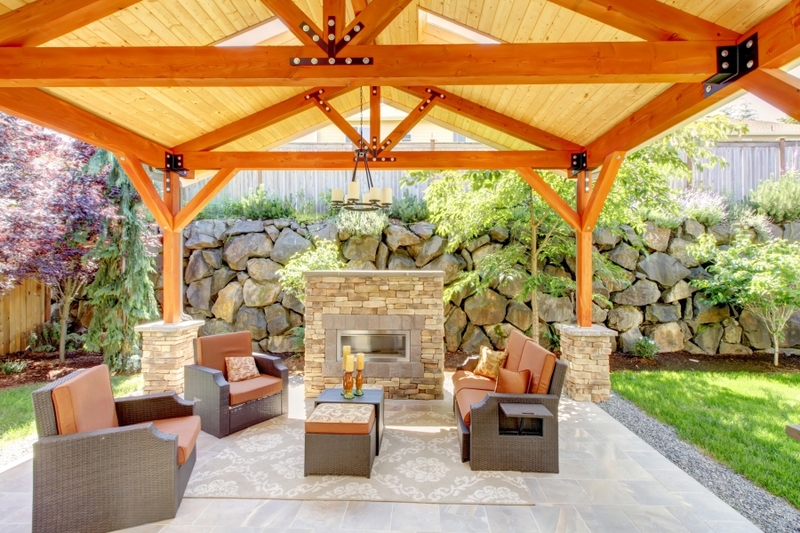 If you are one such resident, it’s important to plan ahead before embarking on your new patio, gazebo, or deck installation. DIYers who need a little professional help will be pleased when they reach out to Virginia Decking & Remodeling for quality assistance through each step of the process. For years, our porch and patio builders have worked hard to perfect the process, providing all of the services you need to be your supplier of quality home improvements. Our Virginia team is proud to be your go-to deck builders in Fredericksburg, supplying honest and efficient results that will exceed your high standards. We’re more than happy to lend a hand with your deck or porch project, whether you need standard or custom design work or comprehensive installation services. If you are considering installing a new porch on your home, it’s important to take into consideration all of the factors involved before breaking ground. Below are a few of the most common elements we’ve seen when planning a porch build. Read to learn more, or contact our professional deck company for immediate assistance! Before you embark on a quest to build an ideal porch to optimize the enjoyment of your home, it’s important to procure a plot plan or property survey of your home. Zoning regulations, HOA restrictions, and other rules may dictate where you can build and how much space you can utilize for your project. Homeowners with grand plans for a new rear or front porch may have their ambitions dashed by the restrictions put into place by the authorities. One important consideration for many homeowners is the prevalence of easements for public sidewalks, pipes, electrical lines, utility connections, and more. If there is an easement on your property, your porch building plans may need to be revised! If you cannot find a copy of your property survey, it may prove beneficial to reach out for help. Homeowners who have no way of tracking down their property diagram can search out help from a local surveying company. Having this information in-hand can be very beneficial for many reasons, the most important being that it will go a long way in helping you obtain a build permit with your local agency. Our porch design experts can help you craft a solution that fits the dimensions and restrictions imposed of your property. Planning a porch build means you have full control over the layout and purpose of this new space. It’s important to plan according to your goals for this new porch, whether it’s for hosting grand parties or simply for relaxing and watching the sunset with your significant other. Some homeowners may decide on a full outdoor living space, including seating spaces and built-in appliances for food prep. Others will settle for a simple design, utilizing a table and two bistro chairs instead. 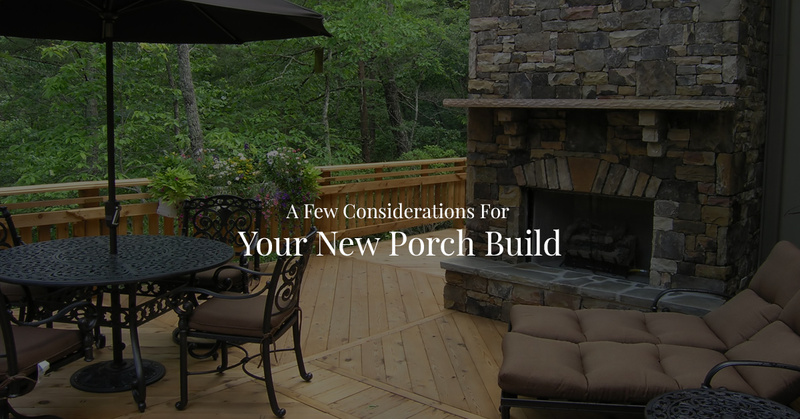 There is no wrong answer, so be sure to consider your plans for the porch before building. Many citizens invest in deck and porch builds to create a dynamic space for entertaining guests and loved ones with ease. Planning and building for this purpose will require a lot of planning and decision-making. It’ll be important to create a seating area that holds all-season furniture and decor to create a comfortable space for relaxing. When the temperatures drop, it pays to invest in a heating system such as a space heater or fireplace. In any case, it’s important to fully consider the needs of your new porch before building it. How you plan on utilizing your new space will affect how much space is needed for comfortable use. Homeowners who plan on hosting events with their grandchildren will need to plan on extra space for running and playing. This “cushion” space will help to keep your new porch comfortable and safe while still retaining clearance for an optimal flow of traffic. Remember that the cost and complexity of your porch build will rely heavily on the size of your new slab. It’s important to consider all of the factors before you get to work; jumping the gun and deciding on the dimensions of a new porch too early can have costly consequences! When you plan on using your porch will also affect its design and complexity. Virginia is known for hot summers and frigid winters, making it difficult for homeowners to create a usable, comfortable space throughout all four seasons. For those that enjoy the great outdoors year-round, screens, windows, and a fireplace can all be installed for the best outcome. One of the biggest parts of any deck or porch installation project is the budget, plain and simple. Many homeowners have creative ideas on how to optimize their space, yet the process of financing their project can easily change the outcome. Before you begin acquiring tools and materials for your porch build, it’s essential to set a hard limit for the project. Doing so will save a lot of stress (and hopefully money!) in the long run, and help you avoid the scramble that occurs when you realize that your cost-effective project has run over due to errors or costly additions. The thought of hiring professional porch builders to complete your project may not sound attractive, but our experienced contractors can help! Virginia Decking & Remodeling was founded to provide personalized solutions to each of our clients. Every project and homeowner is unique, and our approach reflects that accordingly. Our specialized processes and inside source for materials ensures that you are receiving cost-effective services. From porch designs to full installations, our team is here and ready to get the job done. If you’re in need of professional porch and deck builders in Fredericksburg, you’ve come to the right place. Contact us today to learn how we can optimize the outcome for your porch build!